This spot is revered by Mactan Island residents more than any other place. A marker says it was on that site that a man who had sought dominion over the island in the name of the Spanish king had died in the hands of the brave warrior chieftain Lapu-Lapu 485 years ago. Lapu-Lapu’s deed is fact but it spawned legends about the man–how he defeated the Spanish forces with their powerful artillery (guns, swords, cannons, cross-bows, body armor) and killed their leader Portuguese explorer Ferdinand Magellan–and what became of him. It is said in the island that the chieftain did not die or that at least nobody ever saw him die and the islanders believe he has been turned into a stone and is forever guarding the seas of Mactan. Fishermen in the island city point to a stone shaped like a man in the deep and they throw coins at it as a way of asking permission to fish in the chieftain’s seas. Another popular story passed on from generation to generation of island residents says Lapu-Lapu became the statue placed on a pedestal at the center of the city plaza. This statue faces the old City Hall building, where the mayors used to hold office, and once held a crossbow in the immortal stance of someone about to shoot an arrow at an enemy. The people decided to replace Lapu-Lapu’s crossbow with a bolo after three mayors of the city died one after the other from a heart attack. One of the folklore about Lapu-Lapu also tells of a man forewarned about the attack. In a council with other people in the tribe over the coming battle, Lapu-Lapu reportedly took his pestle and said he was going to throw it hard and if it would go through three coconut trees then they had nothing to fear because they were going to win. It did and the rest is history and myth. The place where Lapu-Lapu and his men triumphed over the Spanish invaders on April 27, 1521 has been turned into a shrine. The shrine sits along the boundaries of the villages of Punta Engaño and Mactan in Lapu-Lapu City on the island of Mactan. Magellan had come to Cebu through Homonhon, an uninhabited island in the province of Eastern Samar. There, he and his crew were sighted by Rajah Calambu of Limasawa and he guided them to Cebu on April 7. In Cebu, Magellan became friends with Rajah Humabon who prevailed upon the Portuguese explorer to go to Mactan and punish Lapu-Lapu. It is widely believed that Humabon was at odds with Lapu-Lapu and that they fought over control of land. Antonio Pigafetta, chronicler of Magellan’s trip, survived the battle in Mactan and told of how they were overwhelmingly overpowered on the island’s shores by at least 1,500 native warriors, a report that has been held by historians as questionable and grossly exaggerated. Three monuments in the Mactan Shrine are worthy of note: the Magellan Marker, the Magellan monument, and chieftain Lapu-Lapu’s statue. A note written in the marker, shaped like a large headstone, says it was on that spot that Magellan fell dead in the hands of Lapu-Lapu. A little farther away is a monument to Magellan, an obelisk on a base of several levels said to have been built in 1866 during the administration of Augustinian priest Simon Aguirre, who was cura of Opon (the old name of Lapu-Lapu City) in 1857-71. As early as December 1840, Spanish Governor-General Francisco Alcala had approved a plan to construct a monument in honor of Magellan. The circumstances of this monument’s construction was not clear but Karl von Scherzer, a member of an Austrian naval expedition who visited the Philippines in 1858, wrote about a monument to Magellan on the promontory of Punta Engaño. Historians believe this does not refer to the obelisk that is now in the shrine. 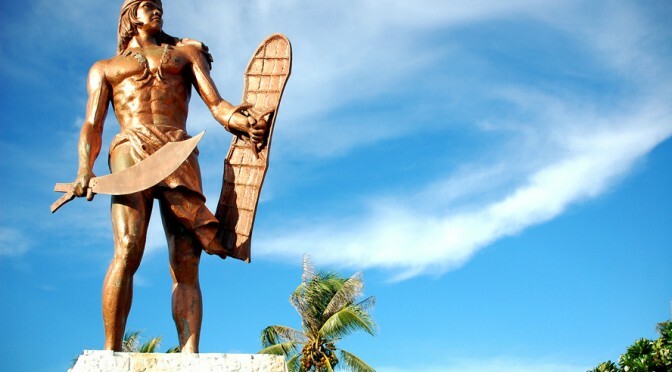 Also within the Mactan Shrine is a statue of chieftain Lapu-Lapu holding a bolo in one hand and a shield in the other. The shrine that houses the three monuments doubles as a plaza that locals and tourists frequent. The shrine is host to the annual Kadaugan sa Mactan celebration by the Lapu-Lapu City Government. The celebration commemorates the battle for Mactan and is held in the shores near the shrine every April.